A study of ‘between-city coordinated migration’, examining aggregate, anonymized data on all Facebook users who list both their hometown and their current city on their profile. Large-scale migrations are an important part of human history. Whether they result from economics, wars, natural disaster, cultural imperatives or state policies, the worldwide flows of human beings are highly complex and notoriously difficult to measure. Here attention is turned to a specific, kind of human migration, called ‘coordinated migration’. In a coordinated migration, a significant proportion of the population of a city has migrated, as a group, to a different city. More specifically, a flow of population from city A (hometown) to another city B (current city) is considered a coordinated migration if, among the cities in which people from hometown A currently live, city B is the city with the largest number of individuals with current city B, and hometown A. To study between-city coordinated migration, aggregate, anonymized data on all users who list both their hometown and their current city on their Facebook profile, has been examined. For a given hometown h, let c(h) denote the most likely current city of the users from hometown h, that is, the city c(h) is the most often listed as current city among the users from hometown h. Let p(h) denote the percentage of users from hometown h who currently live in the city c(h). Note that p(h) essentially represents the (empirical) conditional probability that a user lists c(h) as current city given that he or she lists h as hometown. For instance, say 1,000,000 people list Boston as their hometown on Facebook. Out of these individuals, 300,000 list Boston as their current city, and no other city has more individuals listing Boston as their hometown. From the definitions above, it follows that Boston is the most likely current city for people who grew up in Boston. People who grew up in Boston still live there with a 30% probability. This is quite a common occurrence – for many cities, people are most likely to stay where they grew up. The study of coordinated migration focuses on cities for which the most likely current city is different from the hometown. For example, 67% of the individuals with Badagri, Nigeria as hometown have Lagos, Nigeria as their current city. Lagos is the most likely current city for people from Badagri. ▪ At least 100 users have listed city h as their hometown. ▪ At least 20% of the users with hometown h have current city c(h) in their profile (p(h) > 0.2). ▪ The hometown h and its most likely current city c(h) are different cities. To reiterate, what we look into here are those cases where at least 20% of the users from city h moved out AND currently live in city c(h). For this reason, we gave the name of “coordinated” migration from hometown/origin h to current city/destination c(h). 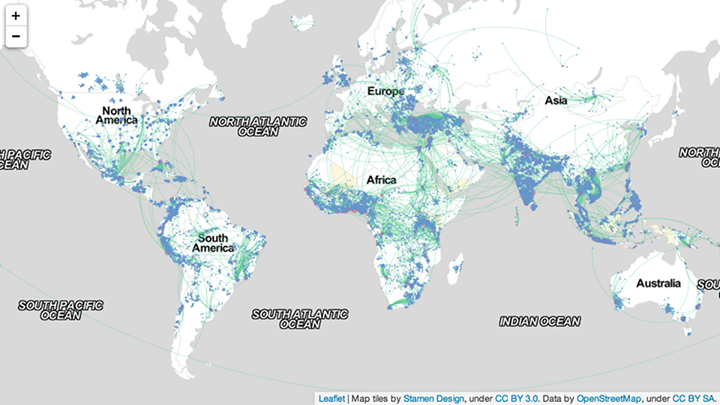 The map below represents coordinated migrations over the world. Besides the coordinated migration, the map highlights (yellow shade) the countries with the largest urbanization growth between 2000 and 2012, according to the data from the World Bank. The importance of a destination for coordinated migration is measured by the number of coordinated flows arriving to the city, rather than the total flows of migrations to the city. Large urban centers in occidental countries (e.g. San Francisco, New York City, Paris, and so on) are not the destination of a large number of coordinated migrations. 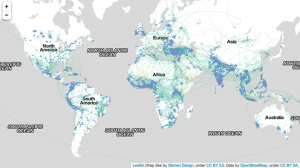 These urban centers attract population from all over the world, but rarely in a coordinated way. For example, people moving to New York City could have moved to another large urban area and no coordinated population movement arises. ▪ Migrations from Cuba: For these migrations, the main destination city is Miami. Here we are most likely witnessing the effect of selection bias. Arguably, Cubans who move to the United States are more likely to have access to the Internet and use Facebook than Cubans in Cuba. As a result, the data may be overstating the extent of coordinated migration originating from Cuba. Nonetheless, it is reasonable to infer that individuals who emigrate from Cuba are most likely moving to Miami. ▪ Migrations from Mexico: For these migrations, there are several destination cities in the United States (notably Chicago, Houston, Dallas and Los Angeles). We interpret this phenomenon as a chain migration: a person first moves and is then joined by other persons from the same hometown. However, the migration is done somewhat independently for people originating from different hometowns. Istanbul arrises as one of the cities with the largest number of coordinated migrations. A large proportion of the migrations come from other parts of Turkey, while the rest originates from East Europe. We believe that these migrations have cultural and political motives, on top of economical ones. For instance, we observe migration from Bulgaria (with a considerable Turkish minority) and from majority-Muslim Bosnia. For additional clarity, the visualization below only shows coordinated migrations with Istanbul as their destination. Individuals who did not list both their hometown and current city are not taken into account in the study. The results are influenced by the ease of access to Facebook in different parts of the world, and the amount of information shared by users from different cultures. An individual moving to an area with easier access to Facebook may fill in his/her profile retro-actively, whereas he/she might never have created an account if he/she had not moved.